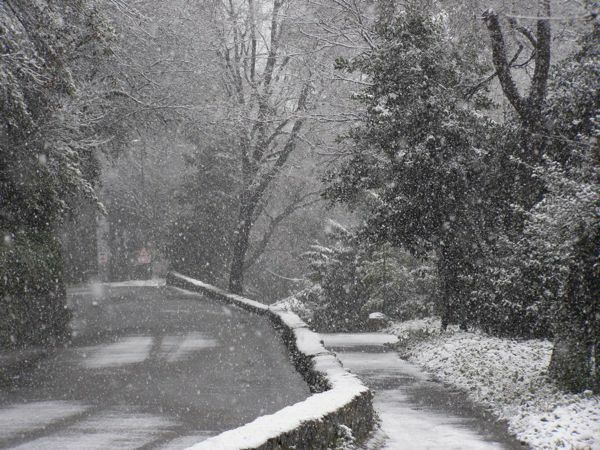 After a 24-month hiatus, Winter has rediscovered Istanbul—and it’s great fun! We’ve been teased with snow flurries all week, whetting everyone’s appetites for the inevitable cancellation of classes. In recent years school has been called off at any hint of snow (due, I am told, to a child’s death on his way home from school during a snowstorm). 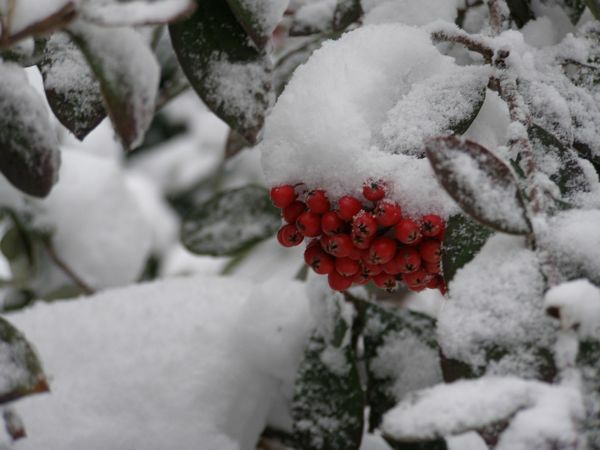 The first year I was in Istanbul, we had a snow day for mere flurries (by Minnesota standards). Then when we had an actual blizzard in January, we got a full week off. Of course, you must remember that this is a city without snowplows—and with precious few snowshovels. 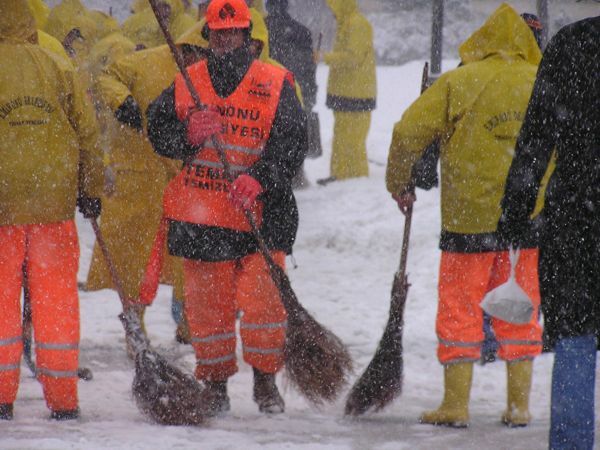 People use spades, brooms, squeegies, and dustpans to remove the snow. Believe me, it’s a backbreaker to clear your driveway with a dustpan! I think we had eight snow days that year, then last winter we hardly saw a snowflake. But Winter has returned. Yesterday (Saturday) it snowed off and on all day, but since it warmed up mid-day, much of the snow melted away. I went into the city to meet a few former Koç students for a late lunch (such a joy! ), then hooked up with friends for dinner. Amazingly, in spite of the storm, I got back to campus in just over an hour, climbing the hill through a mere inch of snow. 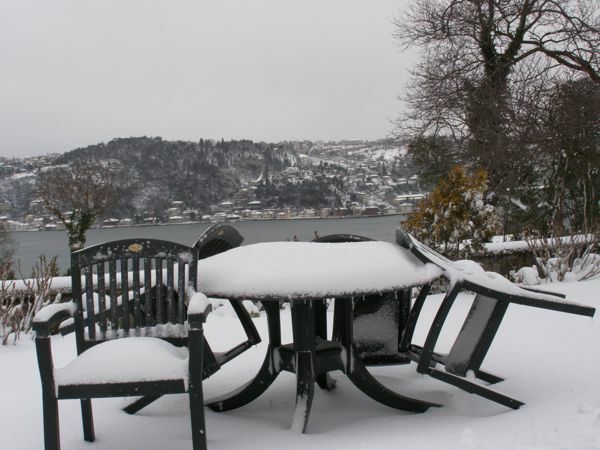 This morning, however, I woke to an amazing winter wonderland: three to four inches of heavy snow, blown by blasts of wind from the Bosphorus. There’s always wind in Istanbul, but particularly after a snowstorm, I guess. As a Northern Minnesotan I’m more than accustomed to snow (we have it five months each year), but here it’s a real novelty, even to me! Robert College has a snowplow (after all, it IS an American school), and the maintenance crew ran it up and down the winding, cobbled roadways all morning long, trying to keep pace with the snowfall. 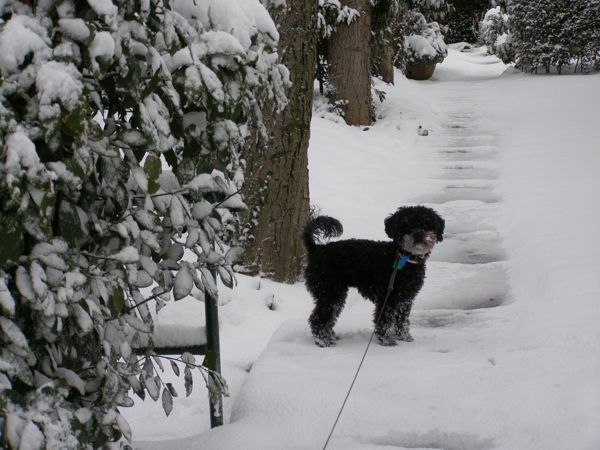 As my dog Libby and I trekked through the storm this morning, she was thrilled with the return to “normalcy” in her life, cavorting with the snow like a long-lost friend. We checked out new routes around campus, and I realized how incredibly steep some of the campus roads are. There’s one section that’s so steep the guards set up barriers and plowed around it, across drives behind the buildings. I picked my way down that steep section, which was a little like descending a snow-covered mountain peak. I’ll be amazed if we have school tomorrow. 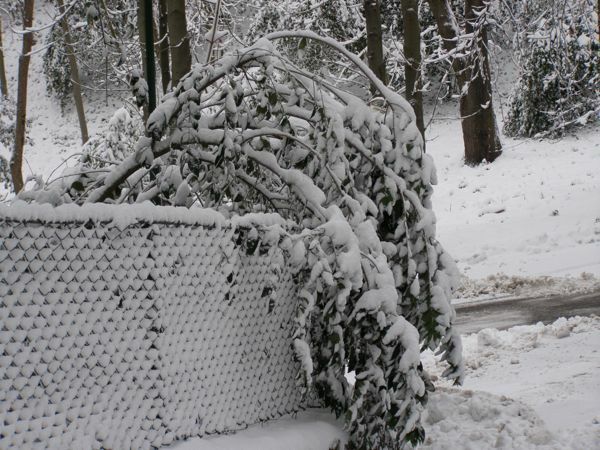 Deciduous shrubs and trees struggle with the heavy snow. The guards were jerryrigging chains to their “guardmobile” tires as we walked by the main guard station, and NO one was driving the school roads—except for the taxi we called to bring us to a grocery store. Our service bus to IKEA and REAL was cancelled this morning (weather, of course), so one of the bilingual teachers called for a taxi—WITH snow tires. No thwarting a Robert teacher’s plans! Well, my first week at Robert College is behind me, and my groceries are all put away. Though I’m not sure I need a day off quite so soon, I’m open to the idea, as any self-respecting teacher or student would be. I have papers to correct, planning to do, and maps to finish for my latest book project. I guess I could use the extra time. Who couldn’t? Welcome back to Istanbul, Winter. Next postThe Scarf: Oppression or Freedom? Funny how we love our kids but it’s always a bonus getting a day off. We didn’t get the snow in Baku. Sob. At least, not in the last week. Hi Ann Marie, I love to see that you are from Minnesota! I grew up in Wayzata, MN and now am studying at Mimar Sinan universitesi in Istanbul. I think Jake found my blog and that led me to yours. I look forward to reading over more of your blog…take care.